Thank you for your interest in Jim Elliot Christian High School. There are multiple ways to learn about Elliot and what makes us different - all outlined below. As each opportunity highlights a different aspect of campus life, we encourage you to attend them all! This event provides you and your student an opportunity to attend a Chapel, meet students and staff, and learn more about our school. Applications are available beginning on Preview Day. 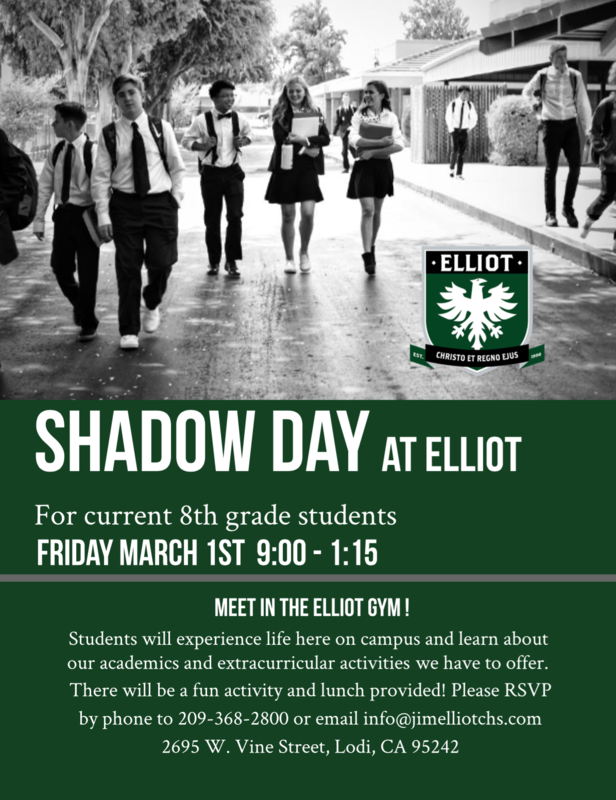 Jim Elliot sets aside special days to invite potential students to shadow a current Elliot student. Shadows will experience life here on campus and learn about our academics and extracurricular activities we have to offer. Families with younger students are encouraged to register their student on our prospects list to ensure that they will receive timely and helpful alerts to early registration information during our enrollment periods. This will also assure your student will receive invitations to all our preview days, shadow days and other important information. We send out a weekly Newsletter throughout the school year. If you have not had the opportunity to spend much time on or around campus, our Newsletter is a great way to get a sense of Elliot. Subscribe here! Prospective Elliot students are evaluated on the basis of their past academic achievements, behavior references, application questions, personal interview and demonstrated potential for success at Jim Elliot. Jim Elliot Christian High School admits students of any race, color, national and ethnic origin to all the rights, privileges, programs and activities generally accorded or made available to students at the school. It does not discriminate on the basis of race, color, national and ethnic origin in administration of its educational policies, admission policies, tuition assistance programs, and athletic and other school administered programs. We look forward to getting to know you more as together we move through the application process. If you have any questions, please contact us at your convenience.